Superlatives can't really sum up an innings like the 258 Ben Stokes made for England against South Africa on day two of the second Test in Cape Town and you probably won't see anything quite like it again. It is the fastest 250 in Test cricket, 30 fours, 11 sixes - that's 186 in boundaries - and the facts and figures illustrate what an extraordinary innings it was. The way he tore the bowling apart was brutal - it was extraordinary hitting. It started with the second new ball on Saturday when he came in on a hat-trick at 167-4 with England in real danger of squandering a really good batting opportunity. The way he attacked demonstrated the way he was going to play and he simply carried on with the same approach on day two. To score at eight runs an over in 40 overs in a Test match is just ridiculous. Once he got going he wasn't going to stop - he imagined he was going to hit every ball out of the park and I don't think there was any answer to him. This is a very inexperienced bowling line-up, the pitch is doing nothing and clearly South African confidence is very low after four defeats in their past five matches, but you cannot take anything away from the way Stokes played. Listen - "Stokes batted like Gilchrist and Sobers"
The way Jonny Bairstow supported Stokes was excellent and demonstrated the maturity that has been introduced to his game. He played quite carefully through the nineties - he really wanted that hundred - and there was no way he was going to miss out again as at Lord's against the South Africans in 2012, when he was dismissed for 95. When he got to three figures he tore the attack apart as well. It really was breathtaking cricket from both of these talented young England batsmen. Watching Bairstow reach his maiden Test century was an extraordinarily emotional moment. His late father David - a former England player himself - was loved as a jovial, extrovert cricketer. For all of us who know Jonny and his lovely family - mum Janet and sister Becky chatted to me at tea - it was highly emotional. It has been one of those days and I am not sure we will quite see the like of it again. When you have Graeme Smith - as proud a South African as you can find - loving it, you realise what a remarkable day it was. He hated what was happening to South Africa, but as a cricketer he loved and respected what he was watching. All-rounders who are hard-hitting batsmen and fast bowlers are massive characters and Ben Stokes certainly is one of them. He has had his run-ins in the past, such as being sent home from an England Lions tour for disciplinary reasons in 2013. You try to steer them in the right direction without knocking out that enormous self confidence. He's got a great eye and a very quick thought process. He hooked Chris Morris for four and the next ball was almost the same but a little shorter - the ball got higher and was further outside off stump so it was more difficult to play the shot. The adrenaline would have been pumping, the crowd were cheering but he ducked underneath that ball, which was superb shot selection. He is one those left-handed batsman who can hit anywhere from third man to deep backward square-leg. You have no idea where he is going to hit you. 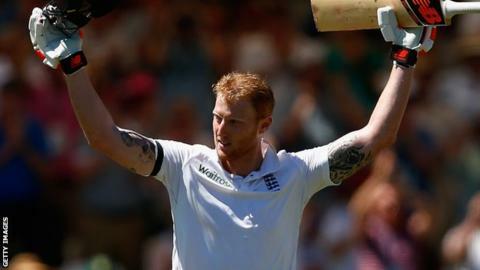 Stokes is 24 and has absolutely everything, with a huge amount of self belief. I don't know whether he will ever play like that again, but he is capable of being a seriously good international cricketer for a good number of years, one who will be treated with a huge amount of respect. There will be times where you want him to play a fighting innings such as his maiden hundred in Perth against Australia in 2013 but this was different, the situation was there for someone to take the initiative. You would rather he did play his natural game but at other times he won't be in that sort of form and he'll have to work hard before he can play shots. For top-class cricketers you are talking milliseconds in terms of when you are hitting the ball cleanly and when you are not. There are some days when it takes you time to find it and other days like here when it clicks immediately. He bowls fast, he knocks people over and he's a brilliant catcher. He is one those stellar quality all-rounders and we are very lucky to have him. South Africa's Hashim Amla is a captain who is struggling, a captain who follows the ball and is playing catch-up. He had only averaged 15 in his previous 10 innings but I thought he batted much better, much more like the man who has made 23 Tests centuries, and played some beautiful strokes. Amla and AB de Villiers are going to be the main obstacles England are going to have to overcome if they are to press home the advantage of a 488-run lead going into day three and 18 wickets still to claim to win the match. Alastair Cook's declaration before tea was timed to allow England to bat a second time regardless of what they bowl South Africa out for now. It can give the bowlers a rest and they have lots of time in the game.